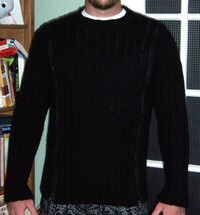 After spending the last few evenings sewing in zippers (yes, plural), the Homme sweater for DH is finally done! It is a perfect fit and he just loves it! Yeah! Too bad it is still quite warm in San Diego... we are not sure when he will have the opportunity to wear it out-and-about. 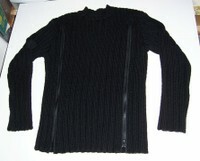 Yarn: Phildar Sport Laine in Black. Alterations: I added a single crochet edge to the zipper openings prior to sewing in the zippers. Other than that, I made no other changes. Impressions: The resulting sweater turned out fantastic, and I couldn't be happier or more proud of myself. DH is a very happy recipient and just loves the cut and style. 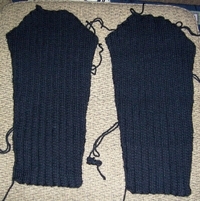 On the flip side, I discovered that I am not a fan of knitting black garments.... especially in a wool and acrylic blend yarn. I am especially not a fan of knitting stitch patterns that do not show up well with the yarn used (the ribbing in this sweater is actually a twisted rib, it's just really difficult to tell). 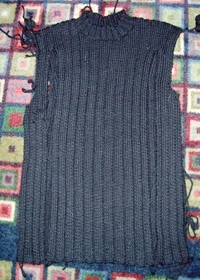 Hence it took me over a year to finish (I started this sweater in October 2005). How much of a bummer is this?!? 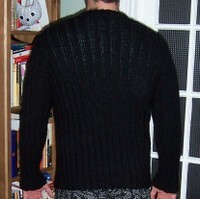 I got DH's Homme #77 sweater all seamed up, weaved in 99% of the ends, did a crochet edge around one of the areas where a zipper is installed, started pinning the zipper in, and discovered it was too short!! Two and a half inches too short! Not even fudge-able! I reallyreally wanted this one done for him before Thanksgiving... And so did he. Oh well. He totally understands, of course. I think I'm more heartbroken over it than he is. Phew.... This took an hour to wire and pin while watching ER last night! Boy knits are so big! It doesn't help that there are two (yes, two!) zipper-seams on the front that needed to be lined up properly. Over the weeekend I hope to get the sleeves on the blocking board, seam the shoulders, get the stitches for the neck picked up and the knitting done on the neck band. The jury is out to whether or not I'll have the patience to seam the rest of it (oh soooo much seaming...) and sew in the two zippers..... boy, oh boy! I must really love him or something! The Rowan Cashsoft is just loverly - it's wonderful to work with! Just some thirty rows from starting the sleeve cap. I'll be bribing myself along with Gastby-Girl-reward-knitting-time on this one just to get it done - it has dragged on forever! Miyon came over last night and we had ourselves a good meal and some good knitting! Guess what she brought for me?!? My kool-aid dyed yarn! Can't wait to swatch these bad-boys. I think I may have overly-abused my yarn while dyeing it - it's a bit felt-y. But this gave me an idea - what if I make a felted bag out of the yarn on the left?? This could be a really interesting experiment - 100% designed by me even down to using my own hand-dyed yarn! Just too cute, isn't it? And so versatile. I feel like I'm all over the place with my knitting, too many projects and not enough time! Jaywalker "zebra" socks, heel flap and turning of heel completed on the first sock. Now I need to pick up stitches and start that gusset. The start of one of the sleeves for Homme #77. One and a half wedges completed on the second half of W. I love that this is a bit of a quick knit - it makes me feel like I'm accomplishing something. In the wings are Betty and the self-control I'm exerting to not start Marcella or the Mountain Peaks Shawl, Peacock Feathers or the Adamas Shawl! Oh, and guess what I got??? Doesn't the suspense just kill 'ya?? Erika came down on Friday night so we could have a girlie day on Saturday! A pattern for Bon Appetit Aprons, another Indygo Junction pattern! We then jaunted back to the San Diego area, and made a stop at Pat's Corner - a "flea market finds" sort of store on 30th and Upas in North Park. I immediately snatched up a re-furbished drop-leaf table with two chairs that will grace our tinny-tiny kitchen (Picture to follow - Andy needs to help me pick it up with his truck). The striping is coming out wonderfully - although I think I should be nicknaming these my zebra socks! We headed back to the house at about five - and Erika departed for home shortly after. I worked on Andy's sweater as I waited for him to come home... and I finished the front piece! Yep - me - not a whole lot new going on around here. I should probably be posting about Stitches West, and all the stash I gained, but since it was like a month ago, I think it's kinda a mute point now. Don't fret - there's many projects planned with what was acquired, and it will all be shown in due time. 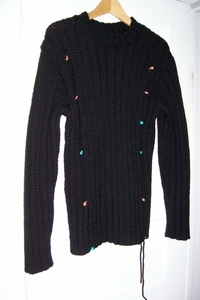 Anyhoos, I've been plugging away at Andy's sweater... imagine this, just six inches longer. So, I have some ten inches to go until I can attach the other two front pieces. Not much progress, I know. The remainder of my knitting time has been swatching and struggling with Betty. The stitch pattern is really a pain. I've experimented with different stitch patterns, trying to avoid the k1f&b of each stitch every other row and then the k2tog, p2tog on the alternating rows. Since the yarn is so dark, I thought I might be able to get away with k1p1 ribbing or maybe moss stitch. Guess what - I can't. My SIL probably couldn't tell the difference, as she probably picked this pattern because of the style of the garment, but I can. Darn that perfectionist attitude! If anyone has any other thoughts on stitch patterns that would kinda look like this, I'll take 'em! Otherwise this sweater is going to take me a year to make! I'm meeting with Kris and Miyon tonight. Yeah! I really look forward to it every week. I figured I would get a couple of rows in on Andy's sweater and then swatch for Jaywalkers - yes you heard right - swatch for socks!! Hard to believe, huh? I'll be using some sock yarn I picked up at Stitches West - Tess's Supersocks, and some needles that Miyon has for me from a purchase we went in on together a couple of weeks ago. I'll post a picture of the yarn tomorrow, and my progress... if I have any!